Around 800,000 years ago the human family split in two. One branch left our African homeland, travelling north into Europe whilst the other remained behind. The migrants found themselves in colder, more hostile environment driving their evolution in a new direction, eventually they became the Neanderthals. Meanwhile those who remained in Africa eventually became us (Boyd and Silk, 2009). The differences between these two groups were not purely biological, but cultural too. The Neanderthals developed their own technology, called the Mousterian. Although it was very advanced when it was first created Neanderthals continued making the Mousterian for a long time after that, falling into a technological rut for over 100,000 years (Otte, 1992). Meanwhile humans continued to develop a suite of increasingly complex technology, such as bone tools, sculptures, fishing gear and much more (d’Errico and Stringer, 2011). Armed with all this new technology, humans began their own migration out of Africa eventually arriving in Europe 40 – 50,000 years ago (Boyd and Silk, 2009). It’s here that things start to get a bit complicated, because we begin to find Neanderthals associated with “human” tools. Is this a result of Neanderthals figuring out how to get out of the rut they fell in, or did the arrival of modern humans have something to do with it? (Zilhao et al., 2005). Ruling out human involvement has always been difficult, given pretty much every example of Neanderthals with modern technology occurs after humans have introduced those tools. There are a few exceptions, such as the site of Châtelperron in France, but these appear to be human tools that have simply gotten mixed up with earlier Neanderthal layers (Mellers et al., 2007). However, advanced bone tools have recently been found in France that can be both reliably associated with Neanderthals and predate the invention of these tools by modern humans. This provides some of the strongest evidence yet that Neanderthals were independently inventing some of the “modern” technologies. The tools in question are 4 lissoirs from the Dordogne region. A lissoir is a specialised bone tool, typically used for preparing hides to make them more waterproof. The finds were dated by 3 different methods (just to be on the safe side) to between 41 – 51,000 years old (Soressi, 2013). Meanwhile modern humans weren’t making lissoirs until around 38,000 years ago and we continue to do to this day (Higham et al., 2010). This finding not only suggests that Neanderthals were independently inventing things, but raises the intriguing possibility that humans were learning from them, a possibility New Scientists has been keen to play up. However, I think the most interesting implication of this study is that Neanderthals were developing “modern” technology on their own. Who knows, if humans hadn’t interfered they may well have come up with their own advanced tools in a few thousand years. This discovery is compelling evidence that Neanderthals were capable of inventing tools on par with anything humans were creating. And it looks like they were pretty good tailors too. Backwell, L., d’Errico, F., & Wadley, L. (2008). 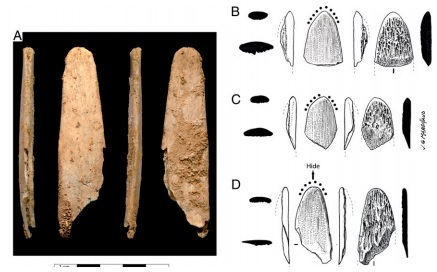 Middle Stone Age bone tools from the Howiesons Poort layers, Sibudu Cave, South Africa. Journal of Archaeological Science, 35(6), 1566-1580. Boyd, R., & Silk, J. B. (2009). How Humans Evolved. WW Norton & Company, New York. Higham, T., Jacobi, R., Julien, M., David, F., Basell, L., Wood, R., … & Ramsey, C. B. (2010). Chronology of the Grotte du Renne (France) and implications for the context of ornaments and human remains within the Châtelperronian. Proceedings of the National Academy of Sciences, 107(47), 20234-20239. Mellars, P., Gravina, B., & Ramsey, C. B. (2007). Confirmation of Neanderthal/modern human interstratification at the Chatelperronian type-site.Proceedings of the National Academy of Sciences, 104(9), 3657-3662. Soressi, M., McPherron, S. P., Lenoir, M., Dogandžić, T., Goldberg, P., Jacobs, Z., … & Texier, J. P. (2013). 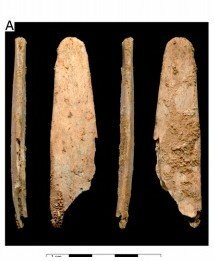 Neandertals made the first specialized bone tools in Europe. Proceedings of the National Academy of Sciences. Otte, M. (1992). The Significance of Variability in the European Mousterian,”.The Middle Paleolithic: Adaptation, Behavior, and Variability. Zilhão, J., d’Errico, F., Bordes, J. G., Lenoble, A., Texier, J. P., & Rigaud, J. P. (2006). Analysis of Aurignacian interstratification at the Châtelperronian-type site and implications for the behavioral modernity of Neandertals. Proceedings of the National Academy of Sciences, 103(33), 12643-12648. Next post: Did language evolve to help us gossip? The human tools are a lot more colorful! Mostly because that pictures includes examples of their symbolic artefacts, which tend to be made of ochre, shells and other shiny things. It’s worth noting that Neanderthals had their own set of shiny things, I just haven’t been able to find a nice representative picture of them. What will we do with Blombos and other african evidences earlier than 50KA BP?